There’s something about Tuesday that’s maybe a bit blah. It’s not quite Monday, but it’s definitely not Friday. 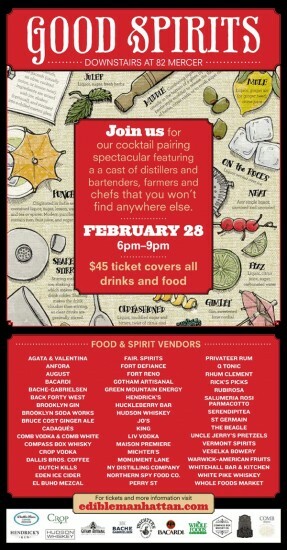 Why not add some tasty excitement to it with a ticket to Good Spirits on February 28th from 6-9pm? You’d better hurry though, because they are flying. You won’t want to miss out on food and drink from over 50 of the city’s best restaurants and distillers, all for just $45 at Downstairs at 82 Mercer in Soho. There’s something about Tuesday that’s maybe a bit blah. It’s not quite Monday, but it’s definitely not Friday. Why not add some tasty excitement to it with a ticket to Good Spirits on February 28th from 6-9pm? You’d better hurry though, because they are flying. You won’t want to miss out on food and drink from over 50 of the city’s best restaurants and distillers, all for just $45 at Downstairs at 82 Mercer in Soho. Get your tickets to Good Spirits here! We’re looking forward to adult milk and cookies from Monument Lane, who is bringing Farmer’s Cross Pig Cracklin’ Chocolate Chip Cookies to be paired with Privateer Rum’s Buffalo Milk Rum Punch, made with Privateer Rum, coffee, cinnamon, nutmeg and buffalo milk. Should you fancy something hearty, Salumeria Rosi Parmacotto will be serving Fiore di Parma and Porchetta Toscana Piacenti, which can be washed down with the Carcano (made with rosemary simple syrup, lime juice, LiV Vodka, and Domodimonti Sangiovese Rose topped with Lantieri Franciacorta. Don’t miss out on your chance to sample the best from that restaurant you’ve been meaning to check out or reward yourself with a cocktail after a long day at work.